The v5.3 update to the Google app will add contextual search functionality to Google Now. Google has updated the Google Now app to version 5.3 and with it comes enables Android Marshmallow’s Now on Tap feature. However, this functionality will only work for those users running Android M Developer Preview 3. Google Now on Tap was one of the big announcements that was made during Google’s I/O event and added the contextual search functionality to Google Now. It will recognise what the user is doing at that particular moment and come up with contextual information. For example, if the user was looking at a restaurant, Now on Tap would be able to to bring up information related to that restaurant. This could include timings, menu, and so forth. The feature can be accessed by long pressing the home button at any time. 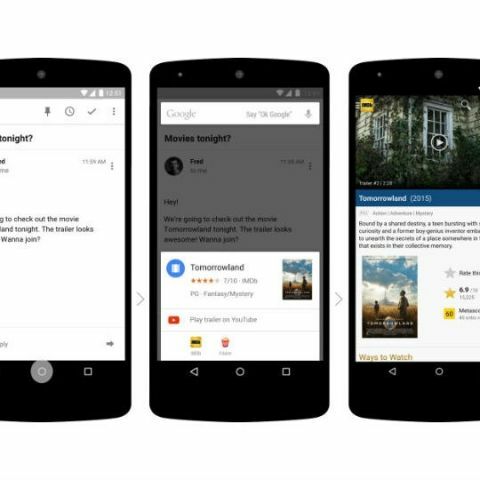 Interestingly, Google said that Now on Tap wouldn’t not be released for the developer preview of Android M.
Last month, Bing had updated its Android app and introduced a new feature that was pretty similar to Now on Tap. Called Snapshots, Bing’s app would also show relevant information without the need to switch apps. It too can be activated by long pressing the home button. A few days ago, it was reported that new product listing on the Google Store are referencing something called Nexus Protect. According to speculations, Nexus Protect could be an extended warranty scheme for hardware sold on the Google Store. It was also reported that Google may have an event on September 29 where it could launch two new Nexus smartphones. LG’s Nexus phone is tipped to come with a 5.2-inch Full HD display with 3GB of RAM. It could have a 13MP camera at the back with a 5MP camera in the front. It could be powered by a Snapdragon 808 processor. Huawei’s version of the Nexus will sport a larger 5.7-inch screen with 3GB of RAM and 64GB of internal storage. The device is tipped to be powered by a Snapdragon 810 SoC. Both the devices with come with fingerprint scanners, USB Type-C ports, and will be the first smartphone to run Android Marshmallow. Which laptop a must buy now for my engineering?